A few weeks ago we reviewed the best Skype phones. There’s now a new phone to add to that list: Apple’s iPhone. Spot Cool Stuff has been a long-time fan of the Kindle Reading Device. The recently-released Kindle 2 is as thin as a magazine, as light as a paperback and has enough storage capacity for 1,500 books! More than 240,000 books are available for download at Amazon’s Kindle Store as are scores of newspapers and magazines. And Kindle books generally cost 30~50% less than their dead-tree counterparts. But you don’t necessarily need a Kindle Device to enjoy some of the Kindle experience. If you have an iTouch or iPhone there’s an app that will allow you to read Kindle books. The Monster Beat headphones is one of those products that’s named after what it truly delivers: a powerful bass. Deeply powerful. Heart-stoppingly, jaw-shakingly powerful. Knock-the-paint-off-your-walls powerful. You get the idea. There is no set of noise canceling set headphones, and quite possibly no set of headphones of any sort, that delivers music with as much thump. If you are a music purist, delight in your trebles, or a big fan of audiobooks then you’d be better off reading our review of the overall best noise canceling headphones. If you are a connoisseur of rock, techno, hip-hop or some other beat-heavy genre, and relish in your bass, then these are the headphones for you. The holiday season is upon us. And so is the need to find cool gifts. Here’s a roundup of some of the presents that the friends and family of Spot Cool Stuff will be finding under their trees shortly. If are one of those friends and family then please don’t read any further. Otherwise, check out our gift recommendations for the photographers and music lovers in your life, as well as for those who (seemingly) already have everything. 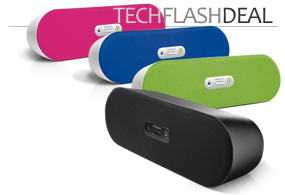 It is impossible for a lightweight, battery-powered portable speaker system to produce the same sound quality that a larger, high end plug-into-the-wall unit does. The laws of physics are too stacked against small, power-efficient speakers for that. But the On Tour portable speaker system from JBL comes remarkably close to breaking these laws. Newton himself would be amazed at the big sound that comes out of these little speakers. We are guessing that he’d also appreciate the On Tour’s design that includes a sliding cover and optional top clamp that can hold a portable game system (Newton being the sort of guy who surely would have had a Sony PSP). What’s most remarkable about the On Tour system, though, is its low cost. At the current Amazon sale price of $50~60 there is absolutely no other speaker system that provides as much quality for as little money. No, we didn’t mis-categorize this post. Onions and all sports drinks containing electrolytes (such as Gatorade) are indeed iPod accessories. And yes, we mean a real, actual, everyday onion. This isn’t some sort of clever reference to the humor magazine The Onion. For playing an iPod through a car stereo system (that doesn’t come with its own iPod adapter) no one makes better products than Griffin. For car stereos with an AUX port there’s the Griffin TuneFlex Aux. For cars without an AUX-port there’s the Griffin RoadTrip .